Just a short, yet very steep climb away (on bike) from our flat is Buda Castle Hill, a sleepy yet unpredictable town that stole my heart. Imagine a medieval and baroque setting with gothic arches, cobblestone streets and homes that date back to the 14th century. Charm exudes from every inch of the hill and really shows its face with much of the architecture still present from its early beginnings. Getting there is easier than you think so long as you utilize public transportation, the Castle Hill shuttle trams, the funicular or your own two feet. No cars are allowed unless you live or work on the hill. For those looking for some exercise and some amazing views along the way, I recommend riding your bike (or renting one) or walking. Make no mistake, the inclines are steep and if you are not accustomed to riding hills, it can be a bit much for a casual rider. If you are not keen on the exercise route but would like a unique experience, you can take the funicular at the base of the hill (just over Chain Bridge on the Buda side). Alternatively, public transport via the bus is available as well. However you decide, be prepared for a spectacular setting that awaits you once you arrive on Castle Hill. 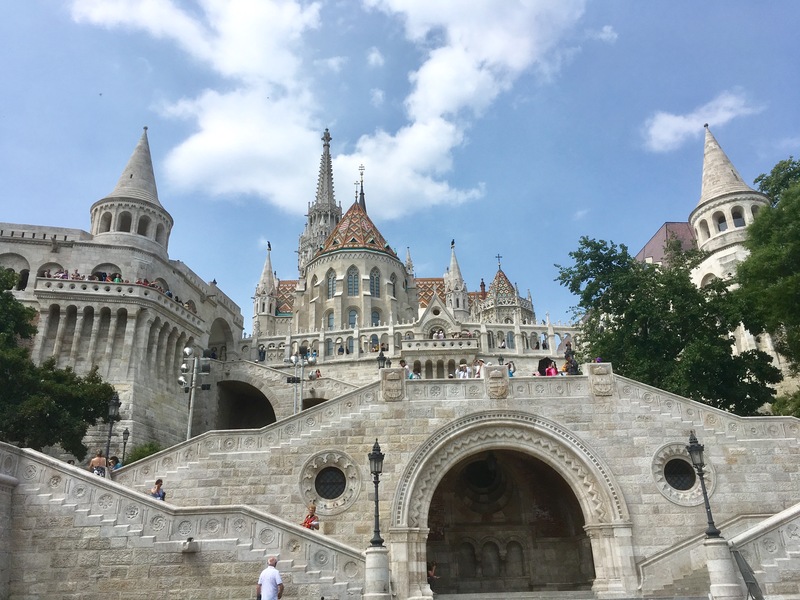 Given I rode my bike to Castle Hill, I took the steep incline that wraps you around to the bottom of the Fisherman’s Bastion, a 100 year young piece of architecture that is well seen from the pest side during day and night. It is worth a stop if you want to climb more steps but I recommend you head straight to the top where you can debark and enjoy this spot from its entry point. The views that await you will leave a lasting impression. One entry point of Castle Hill starts with an outdoor bazaar where you can purchase local goods and souvenirs. The selection is nice, maybe 15-20 stands. This is far less than what you would see at the well-known Great Market Hall but I found this mini bizarre to be better, without the crowds and priced just as well. After visiting the market, I hopped on my bike and rode up and down the medieval streets, stopping to enjoy the architectural masterpiece of Fisherman’s Bastion. I rode down several streets and really enjoyed the unique architecture of the residential areas mixed in with the extraordinary builds of some of the nearby sites. It is no wonder that Castle Hill is recognized as a World Heritage site. I left after two hours of roaming and still have plenty more to see and do. I just loved this place and I hope to visit again this weekend and certainly with future company as well. What started as a leisurely bike ride on Wednesday, I stumbled upon the most impressive Castle Hill district. Castle Hill is a MUST see when visiting Budapest. I would not miss the famous Hungarian Parliament either, but if time is limited, make sure you focus on these two destinations. Wow Castle Hill looks beautiful Ashley! You are steeped in history and beautiful old world architecture. I can relate to the funicular as we often times ride one at Deer Valley to visit the St Regis Resort. You load in the parking lot at the base lodge and it brings you up the mountain to the resort. They light it up at night and it looks like a white path going up the mountain. We are heading to Alaska today. Super excited to start our journey. I will be posting pics on FB! Thank you Donna! It seriously is my favorite place in Budapest so far! We hope you and Bob can come visit. Have a blast in Alaska! Will be looking out for pictures! Thank you for the comment Paula! I appreciate your support and reading along!